Anniversary is a sequence of love poems presented through a fracture of space and time: a husband still here and writing, a wife no longer here but present. Other poems punctuate this: parents, myths, the very young, the very old, various dead, various missing, are lit up in a few lines, then disappear. Places also loom up unexpectedly: a hotel room in Dublin, a lake in the North Woods of Wisconsin, a hospice in Ekaterinaberg, a Paris street. Whether a dream or not, they carry over and are described with precision. Anniversary calls our attention to the circularity of our lives, the ways we live and relive. In these poems time stops, starts, shuffles and leaps, as it does in our minds, illuminated by flashes of emotion, full of light, colour and intelligent protest: 'Even the dying light is light.' He catches the sudden blanks that are filled with the mind's yearning for understanding, sharp changes of direction in the poems that surprise and then open vistas, 'the tug of the soul like a fish on the end of a line.' This is a passionate exploration of what makes life beautiful and devastating, a journey in delight, bereavement and above all memory. Richard W. Halperin has seen over 100 of his poems published in journals, mainly in Ireland and the U.K. since he started sending them out in 2005. He has appeared frequently in issues of Cyphers, Revival, THE SHOp, Poetry Ireland Review and The Stony Thursday Book, and was The Stinging Fly's featured poet in the summer of 2009. 'For Victor Gollancz' won first prize in the 2007 Blue Butterfly Christian Poetry Competition, Inverurie Scotland. He gave his first readings at Glenstal Abbey and at Glencree Centre for Reconciliation, followed by readings at festivals in Bantry and Athlone, and in venues such as the Dublin Writers' Centre, the Dundalk Writers' Circle and the Live Poets Society, Paris. Mr. Halperin holds a Ph.D. in English Literature from the City University of New York. Until 2005 he was chief of teacher education for the United Nations Educational, Scientific and Cultural Organization (UNESCO), Paris, which entailed travel and work in Asia, Africa and Central and Eastern Europe. For UNESCO, he edited the downloadable book Reading and Writing Poetry: The Recommendations of Noted Poets from Many Lands on the Teaching of Poetry in Secondary Schools, available in English, French and Spanish versions. 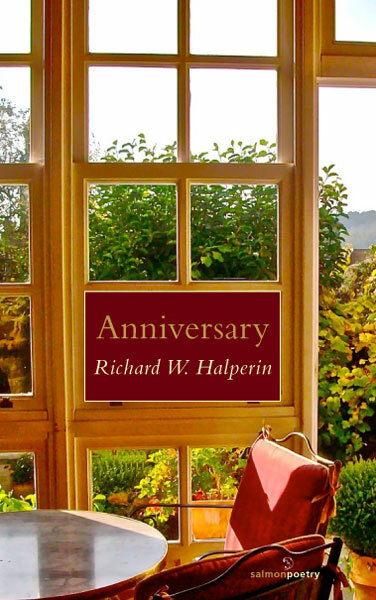 Anniversary is Mr. Halperin's debut collection. This is the best collection of bereavement and loss I have read for a long time: a wife, a father, friends, a one-off glimpse, a moment. It is like a well smoked ham providing the consumer with all the flavour and yet sparing them the eye-watering smoke. This is the residue skilfully preserved by a poet who knows his craft. I was little surprised to learn that some of these poems are competition winners. We are shown how life goes on. And yet, how people are recalled in an unexpected glimpse, a shawl, a thought surfacing. It is an internal world of triggered memories and contemplations that challenge how we see things. For example, But who are you when there is a sunflower? Portrait of a Portrait of My Wife explores the interplay between now-deceased wife, the drawer (a former boyfriend), the husband (now viewer) and that intangible something that hols all things together. The poise of the hand – hers to this day. The stroke of the hand – his that day. The eye of the viewer – mine, not yet twisted away today. Our world, less or more. and burst into a million colours. I thought we were on a fishing trip . . . .
and if you want to know more, you’ll have to read it yourself. You won’t be disappointed. A landscape sheeped with dots/Verb in a pinafore/A lass that side of loss/Our world less or more.